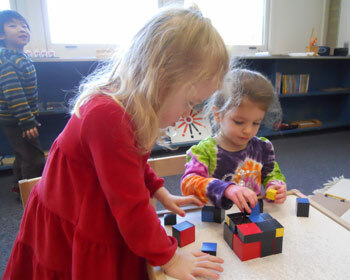 Montessori (pronounced MON-tuh-SORE-ee) education was founded in 1907 by Dr. Maria Montessori. Dr. Montessori was the first woman in Italy to become a physician. She based her educational methods on scientific observation of children's learning processes. Guided by her discovery that children teach themselves, Dr. Montessori designed a "prepared environment" in which children could freely choose from a number of developmentally appropriate activities. Now, a century after Maria Montessori's first casa dei bambini ("children's house") in Rome, Montessori education is found all over the world, spanning ages from birth to adolescence. 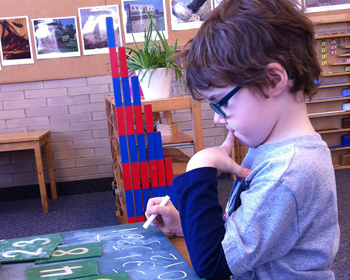 Is Montessori good for children with learning disabilities? Gifted Children? When I observed a Montessori style classroom I noticed there was not a lot of opportunities for pretend play. How do the children explore their creativity? When Dr. Montessori opened the first Children's House it was full of pretend play toys. The children never played with them as long as they were allowed to do real things - ie. cooking instead of pretending to cook. This still holds true today. Are the children able to interact with each other often? There is as much interaction as the children desire, but the tasks are so satisfying that, for these few hours a day, children want to master the challenges offered by them. Then they become happier and kinder true socialization. Also, since concentration is protected above all, as all "work" is respected; children learn early on not to interrupt someone who is concentrating. The sensorial, math, and some of the language and cultural materials (metal insets, sandpaper letters, puzzle maps, bells, for example) are professionally manufactured according to traditional standards that have been tested over many years. Montessori Teachers, for very good reasons, make many of their own practical life and language material instead of buying them as they learn to do in their training, depending on where in the world they live. They gather practical life materials piece by piece. This is an important process that gives a unique quality to each classroom that expresses the culture, and ideas of beauty in each community instead of all classrooms looking alike with no personal touches. Educational materials in the Montessori philosophy serve a very different purpose than in traditional education where the textbooks or toys are used. 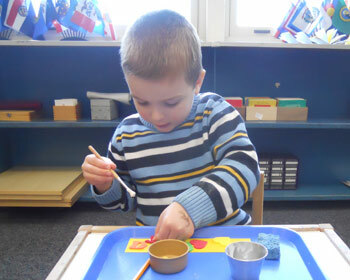 In Montessori, the child learns from the environment, and the teacher is there to connect the child with the materials in the environment. The creation of the environment, and selection of materials is done mostly by the teacher and is very important.